International Journal of Research in Health Sciences,2015,3,4,471-473. 1-Junior Resident , Dept. of Anatomy, IGMC, Nagpur. 2- ssistant Professor, Dept. of Physiology, MGIMS, Sewagram, 3-Consultant, Navratra Hospital and research centre, Nagpur, Maharashtra, INDIA. Introduction: Facial anthropometry is an important tool in forensic medicine, genetic counseling, reconstructive surgeries and certain manufacturing industries. One of commonest parameter studied is nose width. Hence the present study was carried out to study the nose width in western Maharashtra population. Material and methods: The present crossectional study was performed on 100 males and 100 females of 18-25 years of age. The study population were the students from the dental, medical and nursing colleges in Mumbai and surrounding region. Subjects were selected according to predefined inclusion and exclusion criteria. The measurements were obtained using sliding vernier calliper, transparent protractor, measuring ruler and stadiometer. Width of nose is measured as the straight distance between the two alae. Results: In males, maximum nose width was recorded in interval of 35.1 – 38.0 mm (40%) and minimum nose width in interval of 44.1 – 47.0 mm (2%). 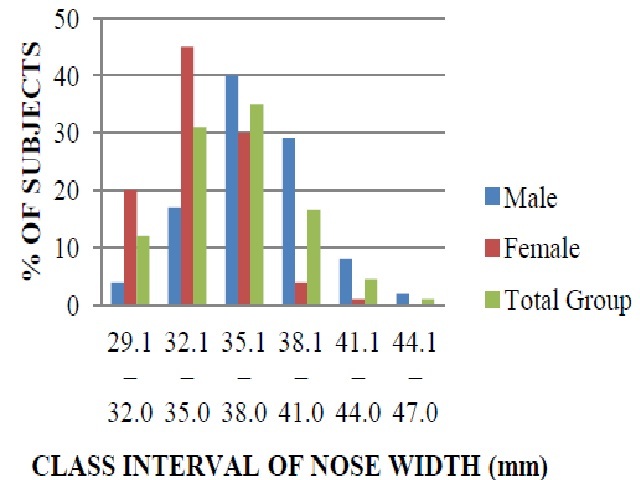 In females, maximum nose width was recorded in interval of 32.1 – 35.0 mm (45%) and minimum nose width in interval of 41.1 – 44.0 mm (1%). In total group, 35% had nose width in interval 35.1 – 38.0 mm while 1% had their nose width in interval of 44.1 – 47.0 mm. Conclusion: The results of the study provide an important data for forensic investigations, physical anthropometry data base and to guide surgeons in rhinoplasty, nasal reconstructions.